The curly hair cat breeds have gained in popularity very recently and this category of cats include a large variety of attractive cats that have a very good personality. The curly hair cat has been well-known in the circles of feline lovers and is accepted as a cat breed by the International Cat Association. The curly hair cats are also known by the name Rex. The Rex cats have been known by several names, which include the LaPerm, Cornish Rex, Devon Rex, and the Selkirk Rex. The curly hair cats have appeared in America and in Europe in various versions. Some have the same form of mutation while other cats look similar, but with different genetics. These types of cats are named Rexes after the Rex type of rabbit. Why are curly Hair cats born? The curly cats are relatively an unusual breed and most people might have never seen such type of cats. The curly coat or Rex coat is caused due to a genetic mutation that is bred into different generations of cats successfully. If these cats are left in the wild it is very unlikely that this gene would survive and might occur very occasionally as an abnormality. This would not become a dominant trait within the breed without the intervention of humans. The most visible trait in the curly cat breeds is the wavy or curly coat. The Whiskers and fur these cats possess are known as the down hair. Each Rex breed has a slight variation in their fur. Some may have very fine hair while others may have wavy hair and some of the other cat breeds may possess a tightly curled hair. So each curly cat breed has different coat traits. One of the best characteristics of the coat of Rex Cats is that they do not shed fur unlike other cats. Even if they shed their coat the loose fur tends to stay within the coat. It is essential for Rex Cat owners to regularly brush or groom them to eliminate any loose hair that might have got stuck in the coat. Is there a relation between all the Rex Cat breeds? It is easier to assume that all the different Rex breeds are related to each other, but this is not true. The Curly coat is caused due to a specific genetic mutation and the exact gene that is responsible for this is different for each cat breeds. The truth is there are several different genetic mutations that are responsible for the curly coat. Hence, cross breeding different Rex Breeds is unlikely to lead to a wavy or curly haired kitten as neither of the genes are dominant. 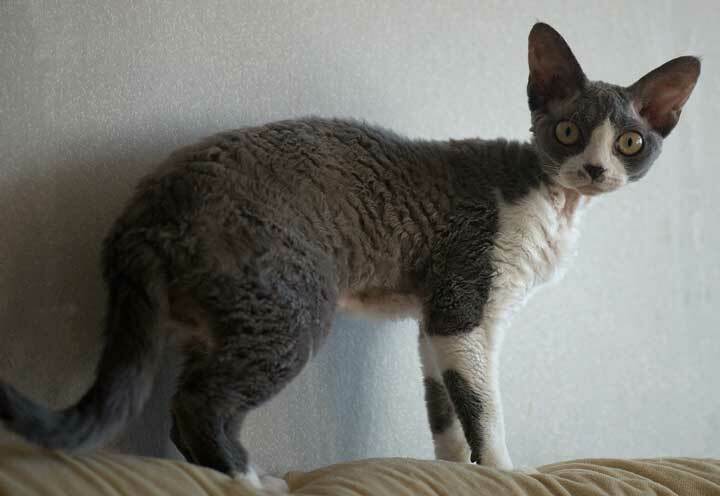 The Cornish Rex and the Devon Rex both come from the same geographic location, but both these breeds are distinctly different from each other as each breed has a different genetic mutation that leads to the curly coat in these cats. There are four main Rex Cat breeds that are recognized and known worldwide. The Devon Rex originated in Devonshire. These cats were assumed to be related to the Cornish Rex, but this was not true. According to a test that was conducted Devon Rex cats were cross bred with the Cornish Rex cats and the kittens that were born did not have any Rex characteristics. The coat of the Devon Rex is soft, curly and delicate. This is a small breed cat with a comical and friendly appearance. Cornish Rex is very popular for their wavy curls that are very soft to touch. The whiskers of this cat also curl. This cat breed enjoys staying indoors and is suitable for apartment life. Cornish Rex comes in many different colors, which includes the lavender, white and chocolate. Cornish Rex is agile, active and playful cat breeds. Originating from Montana the Selkirk Rex is covered with downy and curly coat with each hair arranged in rings. These hair rings lie very close to the body. The breeders look out for curled whiskers in this cat breed as they can become good show cats. They demand attention and do not like to be left alone for longer durations. They are intelligent, affectionate, and friendly and come in a variety of colors. LaPerm is a curly cat full of affection. This is a long haired cat breed with a curly and thick tail that is slightly rough to touch. The short haired variety has denser coat as compared to the long haired ones. Both the longhaired and the short haired cats come in a variety of colors and patterns. These cats love the company of people around them. Due to their dense coat the curly haired cats are not suited for people suffering from allergies. It takes a lot of time and skill to develop this cat breed. Previous articleDifferent Type of Cats What KIND OF CATS Are You?